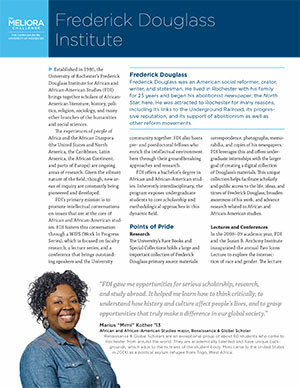 Thank you for considering giving a gift to the Frederick Douglass Institute for African and African-American Studies. Gifts to the institute help to foster cultural understanding and promote conversations on issues that are at the core of African and African-American studies. You can donate to the program online by selecting “Other” under “Choose where you’d like to designate your gift,” and then writing in “Frederic Douglass Institute” in the field via this secure online form. Learn more about what your gift means to the institute through our flier (PDF).